Our Antioch plaster process was developed years ago and has been honed for decades by our company. It is suited to produce airflow impellers. Antioch plaster molds can be poured at a low temperature, which allows rapid solidification and leads to high mechanical properties. Once the mold is through processing, it becomes an insulator as opposed to a conductor, so we can fill thin cross-sections and vanes. 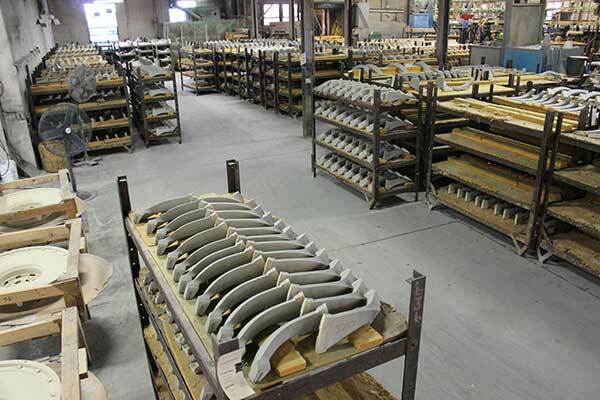 Parts produced with our Antioch plaster process have a surface finish whose quality far exceeds that of parts produced by more common foundry molding techniques. You can expect 100RMS on most parts produced with this process. 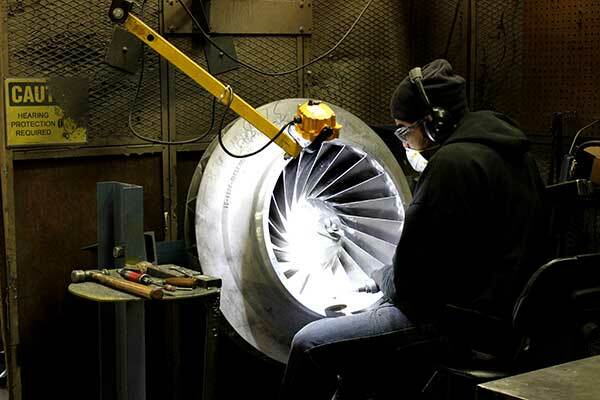 We produce a large quantity of impellers each week, serving customers that are very concerned about aerodynamic efficiency. To meet the needs of our customers, we use very fine 70AFS screen size silica sand and top-of-the-line ASK Pepset binder systems. 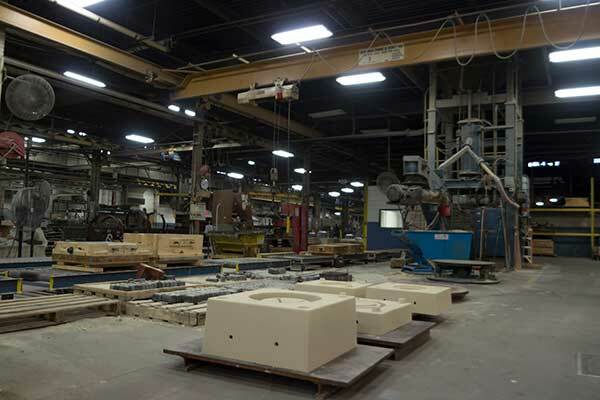 Using quality raw materials allows us to produce sand castings that exceed industry standard. 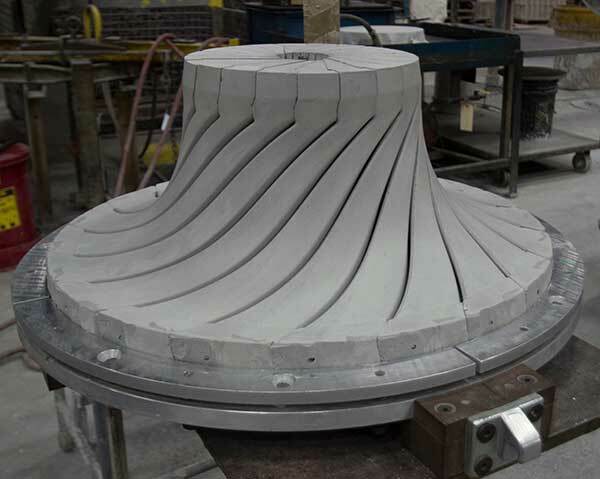 We can produce sand castings that have surface finishes below 220RMS—from what we have observed this is FAR better than the industry standard. 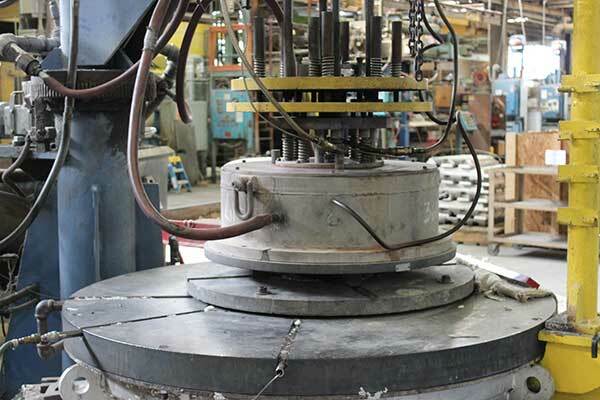 Once the mold is complete and the molten metal is prepared, our LP units are closed and nitrogen is used to prevent any further oxidation of the molten aluminum. Our custom-built LP units are designed to allow an uncommon amount of flexibility in tooling and mold design. Their mold clamping systems can be moved out of the way if necessary. Once the mold is in place the recipes (created by our engineering department) are loaded into the software and the operator can only start the casting cycle when all recipe criteria are met. Due to casting design variability, some parts that we produce do not lend themselves to our low-pressure casting method. 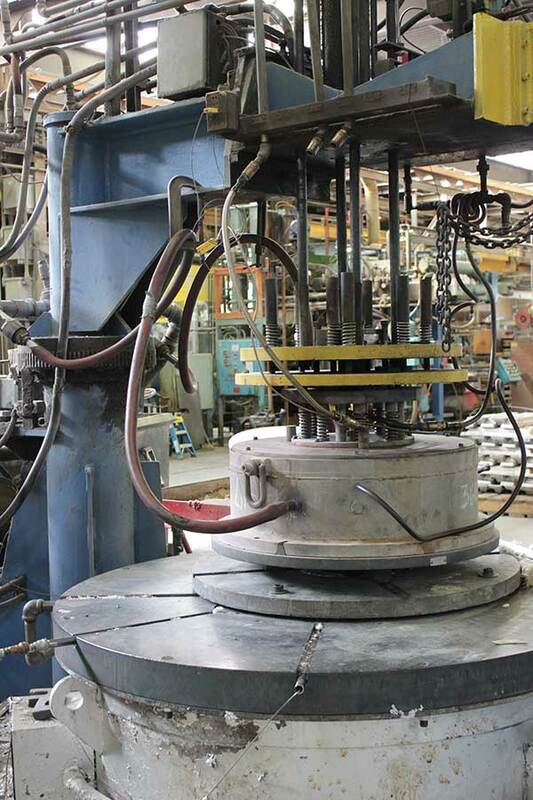 We maintain a robust set of equipment for gravity pouring some of the largest aluminum castings in the world. We have over a decade of experience pouring aluminum motor housings, pump extensions and other components with cross sections over 10 inches thick. 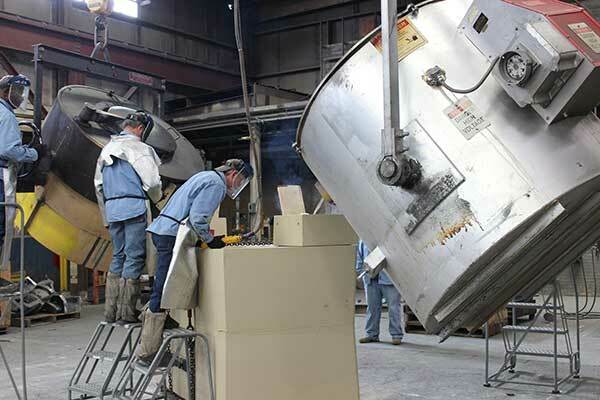 We can pour up to 3,000-pound aluminum castings and maintain x-ray quality and pressure tightness, even with huge wall thickness variation throughout the part. Once the casting is in metal, we use our variety of saw equipment to remove the major gates and risers from the parts. Once the majority of excess metal is removed by saws and CNC mills, each part is carefully hand-finished to remove surface imperfections, flash and chill marks. 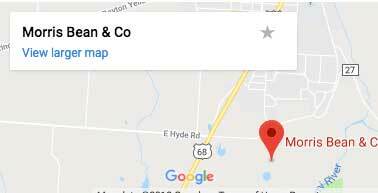 Upon completion of the work parts are cleaned using an automated glass bead hone and are ready for our quality assurance and inspection to start. To achieve total customer satisfaction through innovation, continuous improvement, and on-time quality products.